Ever since hip-hop first exploded onto the global stage almost 40 years ago, its iconography has been as indelible as its sound. From Run-DMC, standing in a b-boy stance (shot by Janette Beckman), to Tupac Shakur flashing a twin, middle-finger salute (Mike Miller), all the way to a somber ASAP Rocky wrapped within an American flag (Phil Knott), hip-hop’s visuals have long communicated the music’s style, attitude, politics and pleasures. Historically, though, the photographers behind these images have dwelled in anonymity, even as their photos have become hyper-visible. Vikki Tobak’s brilliant new anthology, “Contact High,” provides an overdue corrective. “Contact High” traces five decades’ worth of photos, the stories behind them and the community of photographers itself. Hip-hop has seen numerous single photographer monographs before, from Ernie Paniccioli’s “Who Shot Ya?” in 2002 to Sue Kwon’s “Street Level” in 2009 to Brian “B+” Cross’ “Ghost Notes,” published in 2017. However, “Contact High” is far more expansive and inclusive, with more than 50 photographers sharing their experiences shooting hundreds of images. Jamel Shabazz talks about the immortal 1982 photo he took of three Brooklyn kids doing backflips over a dilapidated mattress; Jorge Peniche shares how he captured L.A.’s DJ Quik and Suga Free sipping on mini-Hennessy bottles outside a Paramount hair salon in 2010. However, Tobak didn’t want to just include the photos we’re already familiar with; true to the title pun, she asked contributors to root through their archives (read: shoe boxes) to find their original contact sheets. The contact sheet is a remnant from photography’s analog days, where the advent of compact, 35mm film meant that rows of negative strips were developed and transferred onto paper-sized sheets for easy perusal to select the best shot. We all but take this format for granted today as every digital photo app arranges images in neat grids, but as Bill Adler, Def Jam’s former publicist, explains in his contribution, the contact sheet accompanied a paradigm shift in photographer freedom, where one was “free to click away, one frame after another, until he used up the roll.” This also meant that the camera’s subjects could be caught in candid moments: fixing their outfits, goofing around, yawning, “the kinds of things humans, unlike statues, will sometimes do,” Adler notes. to see the final pick, printed onto an album cover or in a magazine spread, but the contact sheet, with its grease pencil marks and off-center rows and columns, captures the creative chaos behind that single, perfect image. We see the dozens, if not hundreds, of other, before-and-after shots, many looking nearly identical yet just different enough to mark a different moment or mood. As Tobak describes it herself, the “holy grail of contact sheets” comes courtesy of Barron Claiborne’s March 1997 shoot of the Notorious B.I.G. The final image, which later graced a Rolling Stone cover, features Biggie wearing a gold crown, lips pursed, brow furrowed. It’s a melancholic photo, least of all because the rapper was killed in Los Angeles only three days after the shoot. 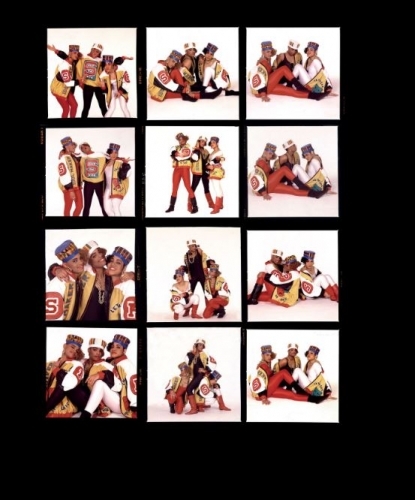 However, in the contact sheet, we see the different poses that Biggie went through. Most are equally solemn but one stands out: Biggie has his head slightly turned, his lazy eye spun askew, and he’s flashing a huge smile; the look is positively gleeful. Compositionally, it’s not a better photo than the chosen one, yet it’s also one of the most humanizing images of Biggie I’ve ever seen. “Contact High” offers many similar moments of surprise and delight. I enjoyed reading Danny Clinch’s contribution about how New Jersey’s Redman freaked out from being buried neck-deep in the dirt for the album cover shoot from 1994’s “Dare Iz a Darkside.” Mos Def-Yasiin Bey fans will geek out over Jamil GS’ photos, also from 1994, where the Brooklyn rapper looks all of 14, posing alongside his forgotten first group, Urban Thermo Dynamics. Tobak’s “Contact High” joins similar books: “Magnum Contact Sheets” (2011), “The Contact Sheet” (2009), “Hollywood Frame by Frame” (2014) and the forthcoming “Contact Warhol.” In an era where digital cameras have made 35mm photography seem as antiquated as 8-track tapes, the contact sheet is a reminder of how physical film may have finite limits but it’s from within those constraints that creativity springs forth. Regardless, Tobak’s best contribution isn’t just in the wealth of new images she offers but also in the simple act of assigning names to them. As MC Shan once rapped about his producer and DJ, Marley Marl: “I’m gonna give the man behind the wheels some credit.” With “Contact High,” Tobak insists we extend the women and men behind the camera the same gratitude.